Young Inoue toji  (Master Brewer) from Sawahime  believes in true local sake and having fun. He believes that local sake should be made with local rice and yeast by local brewers to be “true” local sake or jizake. He also thinks sake making should be fun and enjoyable. Thus, that element is bottled up with his sake and travels to us. Having both Inoue-toji. and his sake made Takase-sensei’s last benkyokai so interactive: sometimes very serious, and entirely a fun drinking event. Sticking to his philosophy, Inoue-toji formed a new master brewers’ school, Shimotsuke Toji last November with two other brewers in Tochigi . The declining number of toji and the aging of the community is a constant issue for sake brewers and sake lovers. So, this unusual movement to create a new school with a younger generation of brewers is a welcome development. Sawahime uses all local rice, Hitogokochi or Gohyakumangoku and local yeast. 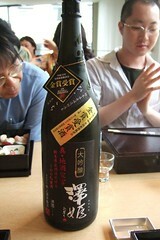 And, his sake is good – the daiginjo won the gold medal at the National New Sake Awards  this year. 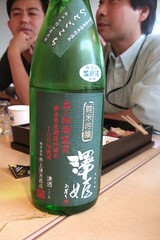 Please visit Sawahime’s web site , Gallery, to view nice flash video of their sake making process. Tokyofodcast Et-chan and Te-chan eat Tokyo by Et-chan and Te-chan is licensed under a Creative Commons Attribution-Noncommercial-Share Alike 3.0 United States License.